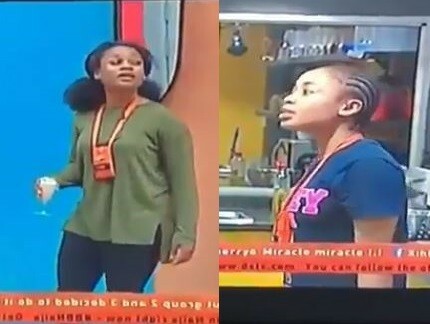 Last night after their Malaria presentation housemates Cee C and Nina got into a heated argument that tore the house in two with some housemates siding with Nina and the others with Cee C.
Last night turned into a furnace within minutes after completing the Lumapil Task. It was all smiles and jeers and laughs one minute and the next it was utter craziness. Cee-C had been provoking Nina all day but things finally came to a head in the kitchen when Cee-C blew up, she insulted Nina and Nina retaliated, at one point there were even threats of physical harm and the whole House had to spring to action to calm the two ladies down and prevent any serious damage. It seems that Cee-C wanted something like this to occur all day and used the excuse of Nina giving Miracle the biggest piece of meat as a catalyst for her angry exposé’.